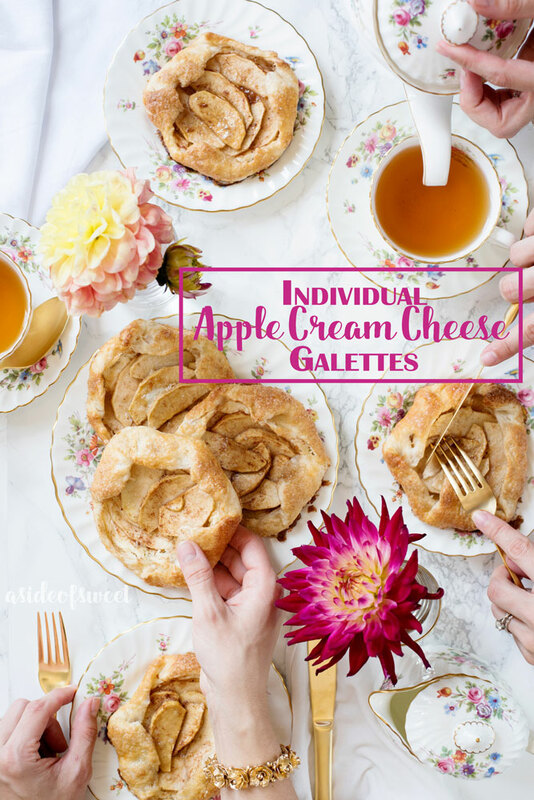 Individual Apple Cream Cheese Galettes are flaky, sweet and perfect. The recipe is easier to make than pies, and it’s perfect for dessert or brunch. My husband took a bite of these apple cream cheese galettes and looked up at me with a glint in his eye. These are “almost too good” were the first words out of his mouth. This prompted me to bundle them out and put them out of sight so they wouldn’t mysteriously disappear earlier than planned. I had made these pretty desserts in anticipation of a tea party with some of my girlfriends, not just for Pat to snack on. 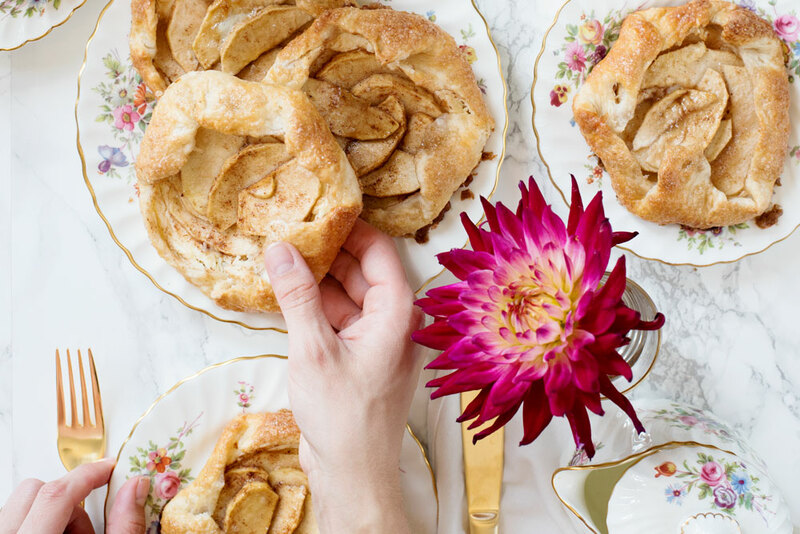 Because what would a tea party be without something sweet to nibble on? Because of my stash of pretty china, getting ready for the tea party was a breeze. All that was left to do was an easy dessert. 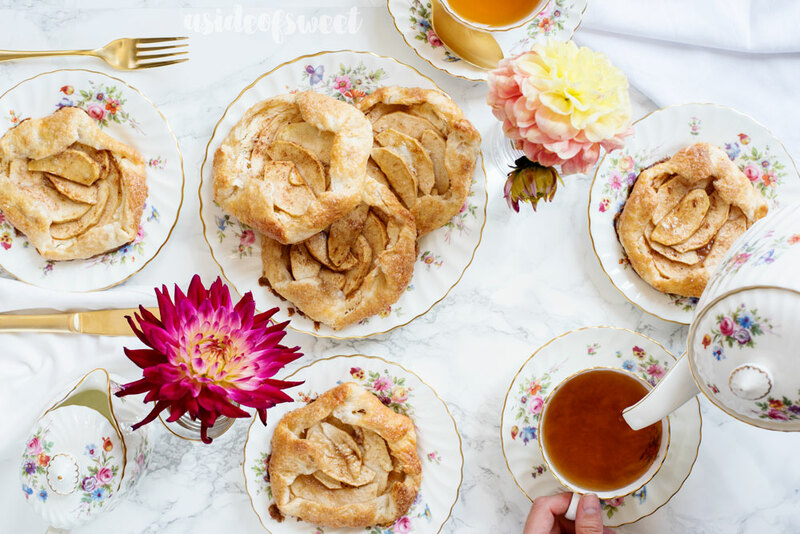 I made these gorgeous individual apple cream cheese galettes and they were a huge hit! I had some extra pie dough in the freezer, so all I had to do was prep the apples and assemble. You can also use store-bought pie dough for a “halfway homemade” approach. Inspired by how well my apple cream cheese hand pies turned out, I added Philadelphia Cream Cheese to my galettes as well. This definitely took an already amazing dessert to the next level! Tucked in under the apples, it makes them moist and rich. It perfectly complements the flakiness of the galette crust. I use Philadelphia Cream Cheese all the time in desserts. It’s not just for cheesecake! There’s nothing quite like it. It’s made with fresh milk and real cream, and without any preservatives. It’s a great way to add flavor and richness to your desserts. Toss the apples, cornstarch, 1/2 cup of sugar, lemon juice, cinnamon, nutmeg, and salt in a large bowl and set aside. Mix the cream cheese, 2 tablespoons of sugar and vanilla until smooth. Divide the pie dough into 12 even rounds. On a floured surface, roll out each round to about 4 inches in diameter. Spoon about 1 tablespoon of the cream cheese mixture onto the center of each round and spread evenly, leaving about a 1/2-inch border. Arrange sliced apples on top of cream cheese mixture, leaving a 1-inch border. Fold the uncovered dough over the apples in an overlapping fashion, leaving some of the center fruit exposed. The nice thing about galettes is that it doesn’t have to be perfect! Place formed galettes on a parchment paper-lined baking sheet. Whisk egg in a small bowl. Use a pastry brush to cover the exposed dough with a generous coating of egg. Sprinkle each galette with Demerara or raw sugar. Bake at 400 degrees Fahrenheit for 40-45 minutes, until golden brown. Serve warm or at room temperature. To make 12 galettes, you will need enough dough to make a two-crust 9-inch pie. I used about 7-8 apple slices per galette. 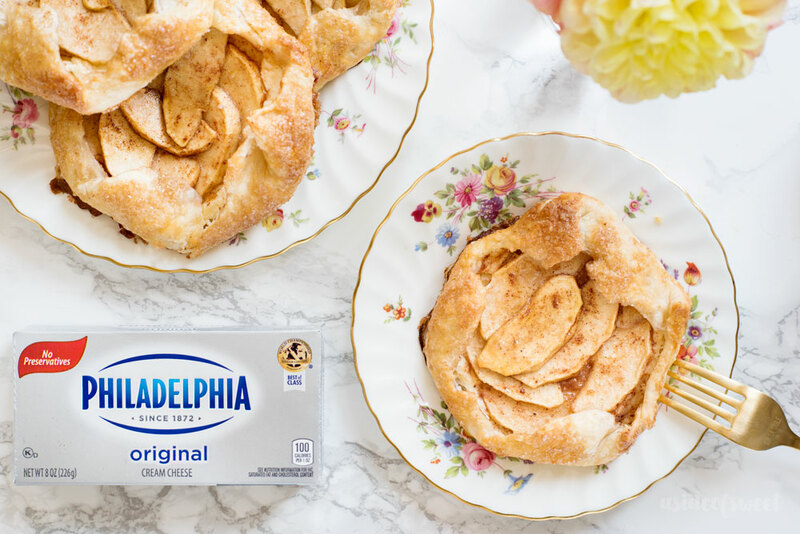 For all of your entertaining needs, turn to Philadelphia Cream Cheese. Always have it on hand to create appetizers and desserts that pop. 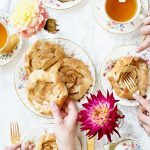 I had a great time developing these Individual Apple Cream Cheese Galettes for a fun tea party with my girlfriends. For more creamy, delicious recipe ideas, click here.